Historically, Veeam Backup & Replication has always used block storage devices as its main storage solution. This choice brought some huge benefits, like leveraging high performance of these systems and allow plenty of random I/O to guarantee fast backups and restores. However, service providers (and end users) have asked for cheaper options for those backups that don&apos;t require a high RTO (Recovery Time Objective), especially Object Storage solution. With Veeam Backup & Replication 9.5 Update 4, the support for Object Storage systems has been added, and service providers can now leverage S3-compatible solutions (both on-premises and from public providers like AWS) and Microsoft Azure Blob storage. This new tier of storage is called "Capacity Tier" and it can be coupled with a Scale-Out Backup Repository, which then become the Performance Tier of the tiered solution. In fact, Veeam doesn&apos;t use the new Capacity Tier as a direct target for backup and backup copy jobs, rather a new mechanism has been introduced. Let&apos;s see how it works and how then a service provider can design his storage with this new capability. The two tiers, Performance and Capacity, work in conjunction inside the same SOBR group. Once at least one object of each type is available in the environment, the service provider can add the Capacity Tier to the SOBR group. 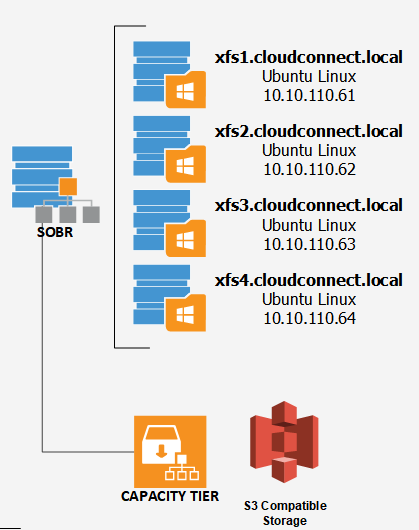 The Capacity Tier is not consumed directly by Cloud Connect, but it&apos;s attached to a SOBR group as an additional Tier, while the multiple extents form the Performance Tier. Note: Capacity Tier can only be attached to a SOBR group, not to a simple repository. This option is useful when consuming a public object storage, since potentially not every extent of the SOBR group is configured to connect to the public internet, or again an administrator would prefer to define a dedicated machine to act as the gateway between the SOBR group and the Internet. In the case of on-premises Object storage however, we suggest to leave this option unselected, so that every extent in the SOBR group can interact with the Capacity Tier, guaranteeing at the same time better scalability and reliability. Backup Copy with GFS: every file created here is a full file, so once it reached the age required by the capacity tier policy, it is immediately moved. These information are important to explain to tenants the best way to configure their backups so to obtain for example cheaper offering for storage if the provider can use a Capacity Tier. NOTE: the creation of periodic full in the chain is also needed for Insider Threat Protection, so it definitively makes sense to suggest customers to use one of the optimal backup chain types.